About 500 people marched in solidarity with Afrin in the city center of Wuppertal, Germany last night. 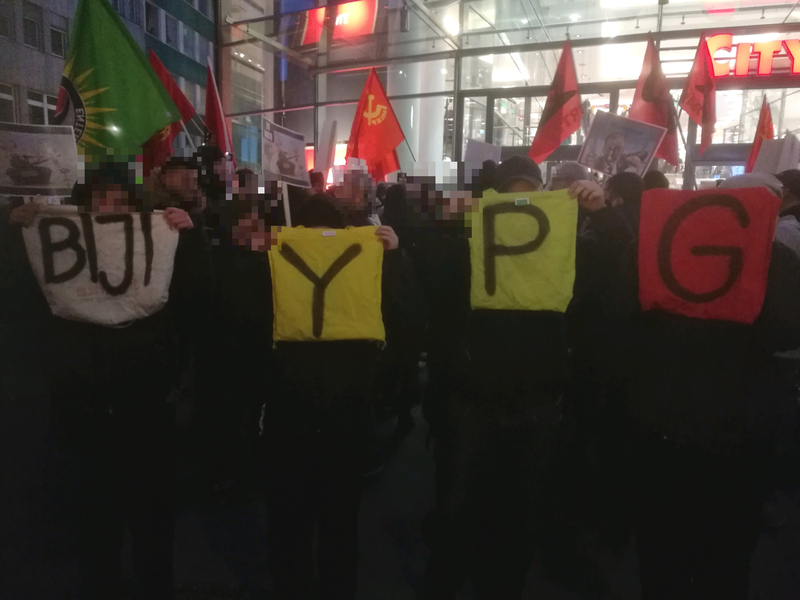 Cops confiscated YPJ and YPG flags before the start of the demo and even wouldn’t allow 3 bags with the characters YPG (image above). Police authorities in Cologne will ban all demonstrations of the Kurdish association NAV-DEM. Read all the reports by Riot Turtle; here. On Monday a solidarity committee for Afrin and Rojava was founded by a big group of activists in Wuppertal, Germany. People from different groups and organisations attended the meeting and the first results were visible at last nights demonstration in solidarity with Afrin in Wuppertal. Anarchists of autonomous groups, Kurdish and Turkish activists and many others participated. The demo was smaller than the last demo in solidarity with Afrin, but that wasn’t surprising. In the past weeks demonstrations in solidarity with Afrin in other cities like Cologne, Dortmund and Duisburg in the German state of Nort Rhine Westphalia were banned or stopped. In the days before the demonstration in Wuppertal, the cops told the organizers of the demonstration that they would not allow any flags with Kurdish colours and many people were convinced that the cops would ban or stopt the demo in Wuppertal. The cops indeed confiscated several YPJ and YPG flags before the demo started, but did allow some other Kurdish flags (image below). Some movements of riot cops before the start of the demo indicated that the demo would be stopped. But the cops suprisingly did not stop the demonstration last night. On the other hand they did not allow a creative reaction by activists on the confiscation of the YPJ and YPG flags. Three bags with the charcters Y, P and G were not allowed in a state were its allowed to sell arms to the Turkish army. The demonstration marched through the city center for about 90 minutes. As far as we know there were no detentions. The Kurdish association NAV-DEM released a press statement today in which the organization stated that police authorities of Cologne told NAV-DEM representatives that all their demonstrations will be banned in the future. Kaplan reacted on two directives of police authorities in Cologne, which banned two demonstrations in solidarity with Afrin in the German city. Police authorities of Cologne wrote in the directives that NAV-DEM is a follow-up organisation of the PKK, which is banned in Germany. This claim of the police authorities was never part of a court case or any other form of official prosecution in Germany. NAV-DEM is an officially registered association which is not banned in Germany but the police authorities of Cologne seem to think that they are the ones who decide which organisation in Germany is banned or not banned. According to NAV-DEM that police authorities in Cologne told them that the ban directives are the result of a new decree by the German federal interior ministry. The federal ministry reacted on Twitter (Tweets below) saying that they can’t discover a general ban and that the German states decide about such bans. But the federal interior ministry also tweeted that demonstrations have to be banned when they are factual organized by the PKK, which is banned in Germany. According to NAV-DEM police authorities in Cologne informed them that they don’t need to register other demonstrations, because these demonstration would be banned as well. NAV-Dem announced that they will go to court to fight against the directives. In the coming days the Turkish prime-minister comes for a state visit to Germany. The new directives are no coincedence; the German state once again falls on its knees for Erdogan, but also have their own interests. The revolutionary project in Rojava seems to be seen as a threat by the German state as well. The bans take the basic rights of the second-largest group of migrants in Germany. What’s needed is a strong answer by all comrades in and outside Germany and more suppport for the Kurdish movement. #Hannover: According to the Cops Chanting “Freedom for #Öcalan!” is a Crime in #Germany – Enough is Enough! #Berlin March 3: United Against the Turkish Attacks Against #Afrin! #Facebook Censors NAV-DEM – Enough is Enough!